This residence, built in the 18th century for a cad, became later the first primary school of Mogador, then found its initial function, that of a family home. The house was renovated by respecting original architecture scrupulously, while arranging on the first floor, 2 continuations and 2 rooms and, by building four rooms at the terrace, all the rooms being equipped with bathroom and WC. Les Matins Bleus is still a meeting point of French-Moroccan friendship. 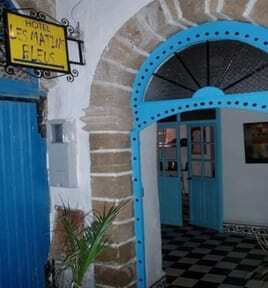 It's a place of Moroccan tradition and European modernity. The suites and rooms, all different, and are decorated with objects from the craft industry souiri. And the sunny terrace offers marvellous breakfasts, with the shelter of the wind. 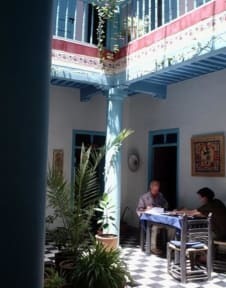 Without forgetting that this residence was that during several years of the great painter souiri, Mohamed ZOUZAF, which left there his print by the presence in the riad of several of his paintings. Our 4-bed rooms have 2 double beds.